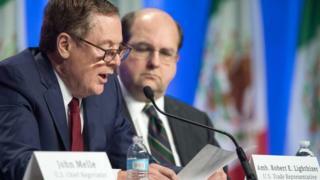 Image caption Robert Lighthizer said Nafta had "failed many Americans"
The US is looking for a "major" overhaul of the North American Free Trade Agreement (Nafta), a senior US trade official said as negotiations on the pact got underway. Mexico and Canada defended the deal on Wednesday in the first day of talks to revise the trade agreement. US Trade Representative Robert Lighthizer said President Trump wanted changes beyond just updating the pact. Talks between the three countries are expected to last for months. "He is not interested in a mere tweaking of a few provisions and a couple of updated chapters," Mr Lighthizer said in his opening remarks in Washington. "We feel that Nafta has fundamentally failed many, many Americans and needs major improvement." The Nafta talks came as President Trump suffered a setback with some of the biggest US companies over his handling of violent clashes in Virginia. Two key White House business advisory councils were disbanded on Wednesday after several bosses quit over how Mr Trump reacted to the far-right rally last weekend. Renegotiating Nafta was a major campaign theme for Mr Trump, who has described it as the "worst deal". He blames it for the loss of US manufacturing jobs, a position that struck a chord with many voters. Mexico's Economy Secretary Ildefonso Guajardo said he was not surprised or deterred by Mr Lighthizer's tough posture, which is in line with earlier US statements. The US will be seeking changes such as stronger labour provisions and stricter rules of origin, which determine where companies can say a product is made. That measure is opposed by US automakers. The US also wants to revamp the Nafta panels used to resolve disputes. Canada maintains that those panels - which have rejected US complaints in the past for industries such as softwood lumber - are critical. "It's fundamental because the commerce department [in the US] takes a lot of measures and countervailing duties which sometimes are unjust and not founded, like in softwood lumber," Raymond Bachand, one of the Nafta negotiators on the Canadian side, told the BBC. "Through that mechanism - which is much faster than the WTO mechanism - we win and these decisions are reversed. So they're fundamental." All three sides say there is an opportunity to "modernise" the agreement to reflect new technology and online business. Chrystia Freeland, Canada's Minister of Foreign Affairs, shared a photo of the talks on Twitter on Wednesday afternoon, saying it had been a "productive discussion ... on the mutually beneficial economic relationship between Canada and the US".